The massive granite slabs that form the walls of Donner Pass are a rock climber’s dream. The quality of the rock walls is excellent and makes for great crack and wall climbing. During the summer climbers can be seen all along Donner Pass road. At the summit of the pass is Mt Stephens which is known as “school rock” to rock climbers. 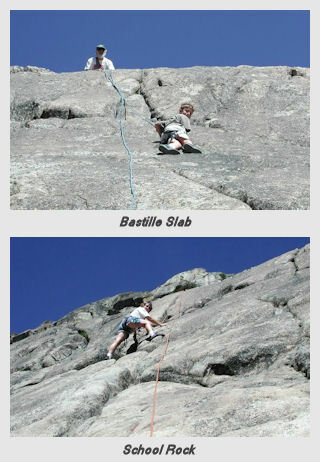 At the base of school rock is Bastille Slab which is a great practice area. School rock itself has several relatively easy multi-pitch routes. A little further down from is the trail up to George L. Stewart Peak which has several nice climbs. Winding down Donner Pass Rd on the right are the rock walls under the snow sheds that offer challenging wall climbs. As the road winds down to the bottom of the pass, there are many climbs in the granite walls on the left side of the road. Rock climbing is an exhilarating experience but it requires proper training and equipment. It is very important that you are experienced in the safety techniques in order to prevent trouble. Fortunately, there are several good reference sources for climbing training and route informaion on the summit. Please use the references below and enjoy the rock.